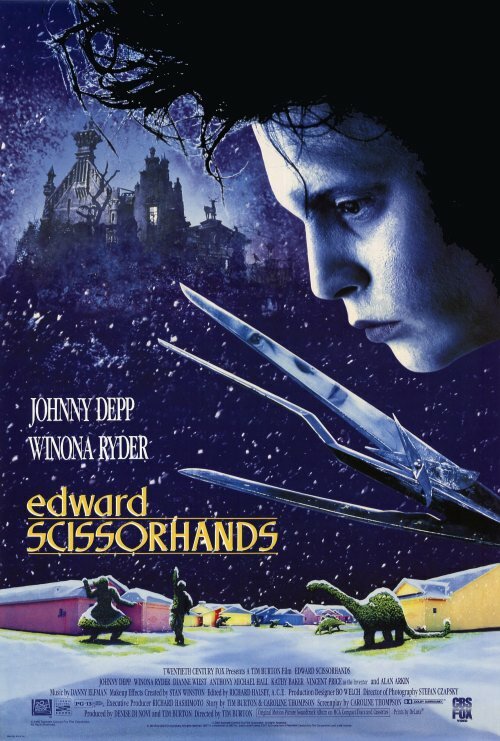 I'd been meaning to rewatch Edward Scissorhands for a while, though I bumped it back because I was a bit skeptical of its status as a holiday movie. Now, I feel pretty confident describing it that way. The movie opens with a brief frame story of an old woman telling a story to her granddaughter. Since we're talking about holiday connections, I'll add that it's snowing outside and the patterns on the wallpaper bear a resemblance to the Star of Bethlehem. We soon cut to Peg Boggs, an Avon saleswoman going from door-to-door in a town of pastel houses laid out on a curved road ending in a cul-de-sac. It's a sunny, bright day in what looks like a suburb of LA in the 1960's. When she doesn't have luck with her neighbors, she turns her attention to a giant castle atop a dark mountain that sits just beyond the cul-de-sac. You really have to admire Burton's flair. She drives up and discovers a courtyard of stone gargoyles and meticulously maintained topiary bushes. No answers, so she barges in and comes across Edward, whose hands are made of knives. His skin is pale, his face is covered in scars, and his clothes appear to be done by the same designer who handles Pinhead's wardrobe: visually speaking, he's a horror monster. But Peg quickly realizes he has a gentle spirit and the mind of a child, so she brings him back home with her. He's of course confused and frightened by the world he's introduced to. At a barbecue, he's introduced to several of the town's housewives, one of whom takes a romantic interest in him. But Edward only has eyes for Kim, Peg's daughter, who's involved with Jim, the movie's primary antagonist. At first, things look good for Edward. His skill at topiary quickly gets him attention, and soon he moves to grooming pets, then cutting hair. He winds up on television and seems headed towards opening his own salon. But things take a turn for the worst when Jim convinces Kim to ask Edward to help them steal some of his father's expensive equipment. Edward's caught, and Jim prevents Kim from helping him. Everyone assumes Edward arranged the theft to cover the costs of opening his salon, since his loan application was denied. To protect Kim, he keeps quiet as other characters reprimand him. Kim breaks up with Jim, who's furious she's choosing Edward over him. At this point, we shift to the holiday season, as the Boggs - with Edward's help - prepare for their Christmas party. In one of the movie's most iconic scenes, Edward is carving an angel in the backyard while Kim dances in the snowflakes falling off. Jim sees this and shouts at Edward, startling him, which causes Kim to get cut. This results in Edward running away while Kim tells Jim to leave and not come back. Edward, furious at the injustice he's seen, throws a tantrum, wrecking several of the topiary bushes he's made around town. He also punctures a tire then carves a bush into a demon's head on the lawn of a woman who'd been especially cruel to him. When he sees a police car searching for him, he runs back to the Boggs' house, where he finds Kim waiting. For a brief moment, it seems like everything will be alright, but then Edward sees Kim's younger brother crossing the street in front of a swerving van. He pushes the boy to safety, but cuts him in the process. Kim, realizing the townspeople will blame Edward, tells him to run. He heads back towards the mountain and castle, followed by a mob. Somehow, Kim beats them there, but Jim shows up soon after. He attacks Edward, who finally fights back to protect Kim. He kills Jim, who falls out of a window into the courtyard, where he's found by the mob. Kim tells Edward she loves him, a connection that seems to offer Edward peace, then she runs out and convinces everyone Edward was killed, as well. The movie closes with a return to the old woman relating the tale. Of course, the grandmother is Kim, and - while she never saw Edward again - she knows he's still alive because of the snow, revealed to be caused by him carving ice sculptures in his castle. It's a good movie, though it's not exactly a consistent one. The first act, where the setting is unveiled, is fantastic, as is the ending. But it's the middle portion that falls a little flat. There's a lot of time devoted to the woman who falsely accuses Edward of assaulting her, and I'm convinced there were better uses for that time (no disrespect intended towards the actress, who does a great job with the part - it's just an unnecessary subplot). Likewise, a great deal of Edward's rise in the community feels like it's part of a different movie: the core of this story is Edward's relationships with Peg, Kim, and the inventor: the rest of the script seems to be killing time. It's not bad; it just doesn't add much beyond a repetitious condemnation of suburban America. First and foremost, this is a movie about being an outsider. Edward is viewed first as curiosity, then as something special, and finally as a threat, and none of it is really his fault. He's just who and what he is; the judgments of others reveal more about their own limitations than his. The last thirty minutes of the movie are clearly set at the holidays. Actually, there's an argument that might be true of the entire movie. Since it's set in an area based on southern California, the pleasant weather doesn't necessarily imply summer, and it's unclear whether any significant time passed between Edward being released by the police and the Christmas party. It's entirely possible that the movie starts, for all intents and purposes, in early December and unfolds over weeks, not months. It's just not clear. But the decorations don't go up until the final act. Other than that, the only times Christmas elements come into play are in flashbacks. Edward's creator was inspired to make him while watching an earlier automatic contraption produce what appeared to be holiday cookies. In a later flashback, he tries to present Edward with hands, which he calls an early Christmas gift. Unfortunately, he dies before he can attach these, which gives Edward some negative associations around the holidays. Between the climax and these flashbacks, it's clear Christmas plays a significant role in the movie, though it's not immediately clear why. It may have had more to do with the visual imagery than anything else. The character of Kim, played by Winona Ryder, is depicted as something of a Christmas angel, and the image of Edward literally creating snow as he carves away ice offers some connections to midwinter. In fact, you could interpret the story as one about a winter god descending into the world of man, judging us lacking, then returning to his castle and sending down snow in memory of his visit. The closing moments outright state that there was never any snow in the town prior to Edward's presence. But you could also interpret this as a variation on the nativity story. Connecting Edward's creation to Christmas offers potential Christ parallels, which are also echoed in the depiction of his hands. He holds these open at times in ways reminiscent of Christ displaying the stigmata, an image also invoked when he inadvertently pierces his own hands over his dying creator. Burton may have wanted to draw a connection between the crucifixion and the mobs that have hounded monsters in movies since the start of the genre. This is a movie about being an outsider, a description that fits Jesus. There's a sense in which humanity's response to Christ was the same as their response to Edward and all who don't fit in. It's admittedly a stretch, but - whatever the reason - Burton seemed to go out of his way to give his movie a holiday feel. In addition to the story elements, the movie was originally released in December, which may have helped it gain a foothold as a Christmas movie, even if it lacks most of the usual holiday tropes.